The Cleveland Indians have spent most of this offseason trading away players to save money. However, they finally appear ready to start adding for the 2019 campaign. On Sunday, the Tribe acquired catcher Kevin Plawecki in a trade with the New York Mets. As part of the deal, the Mets will receive pitcher Walker Lockett and infield prospect Sam Haggerty. Plawecki has spent parts of the last four seasons in the big leagues with the Mets. He was once a top prospect but has yet to fulfill his potential. Despite starting 66 games and getting over 200 at-bats in 2018, Plawecki hit just .210 with an OPS of .685. In his defense, those numbers were posted after Plawecki missed six weeks after breaking his hand in mid-April. 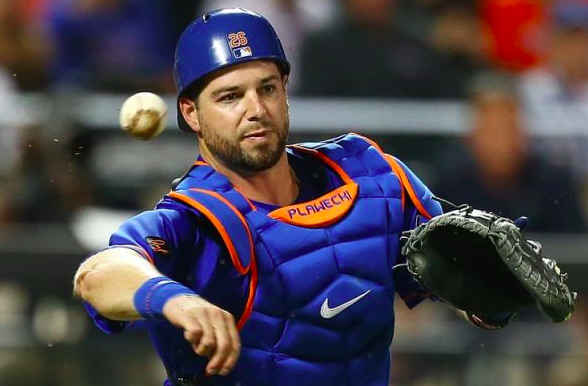 After the Mets signed Wilson Ramos earlier this offseason, they no longer had a spot for Plawecki with Travis d’Arnaud expected to serve as their backup catcher in 2019. Meanwhile, Cleveland’s need at catcher came about when they traded Yan Gomes to the Nationals. With Gomes no longer with the club, Roberto Perez is the only catcher the Indians have with major league experience. Now he and Plawecki will likely share time behind the plate in 2019, barring another addition before spring training. Of course, Perez posted abysmal offensive numbers last season, hitting just .168 with an OPS of .519. Obviously, Plawecki is by no means a guarantee to improve the production the Indians get from the catcher position. But he does offer some upside, so a change of scenery could be good for him. Plawecki is also just 27 and is under team control for three more seasons, so he could be a long-term asset for the Indians, as well as a money-saver for the budget-conscious Indians. As mentioned, the Mets didn’t have much of a need for Plawecki after signing Ramos. He got his chance to be the team’s primary catcher last season and failed to establish himself, so they should have no problem moving on from him. In fact, it’s been assumed since they signed Ramos that Plawcki would be moved at some point. The Mets also add Lockett, who could potentially be useful for them in 2019. Lockett was acquired from the Padres in November, so he never actually pitched for the Indians. He made three starts and one relief appearance for the Padres last season, posting a 9.60 ERA. Also, Lockett has only posted modest numbers for much of his minor league career. However, he should provide viable rotation depth in the minors, something the Mets could use given the state of their farm system. For the Indians, this is a trade that fits what they’ve done the rest of the offseason. They’ve made moves to cut payroll and are now bringing in a player who is cost-effective and has some semblance of upside. Meanwhile, the Mets traded a player they no longer need. New York didn’t get much back in this deal, but Lockett should fill a need they had, even a minor one. In the end, both teams will be lucky if this trade has any kind of meaningful impact.